How sly of Sly to catch the eye and keep his place as time goes by. Stallone has achieved transition and begun the second stage of his career with this exciting and striking film. With a group of super-talents alongside him, his new appearance, although a bit slouched, stands out and gives him his finest hour since Rocky (the first one, of course). All I can say is thank heavens somebody beat the Daylight out of him. We were all worried about what that last vehicle portended. Copland is the nickname given to Garrison, New Jersey across the George Washington Bridge from New York where lots and lots and lots of cops live. Nobody would dare step out of line in that neighborhood, a stone's throw away from the crime filled streets of the big metropolis. NYPD officer Murray Babitch (Michael Rapaport) is sideswiped one night on his way home by two joyriders and, in a rage, winds up shooting at them and watching their car crash. They're both dead and Babitch's problems are only beginning. The imminent danger is that Babitch, recently labeled as a hero, could become slapped with claims of police brutality for this situation. His brothers in arms get to the location quicker than you can say "bent" and plant a gun in the wreckage as well as setting up their fellow-cop's "escape" from the scene. Now the newspapers will tend to concern themselves with the fact that the hero cop is missing, assumed dead rather than any suspicious circumstances. The big, blue boys from the city may be swarming on the bridge, but back in Garrison sloppy, clumsy, partially-deaf local sheriff Freddy Heflin (Sylvester Stallone) is busy trying to maintain law, order and peace; all this without stepping out of line or having any run-ins with his "associates" in blue. Freddy's a good guy who lost the hearing in one ear and his chances to join the NYPD force when he rescued a girl named Liz (Annabella Sciorra) from drowning, then was unlucky enough to lose her to another cop (Peter Berg). Now he's in charge of a lawless town, filled with bad cops and an overabundance of weapons, where he's only allowed to direct traffic and whatever else he can to look after the citizens. If the truth be known, the only real buddy he's got in NJ from among the New York boys is Gary Figgis (Ray Liotta), whose ex-partner got killed while doing time in jail. Nevertheless, Freddy still idolizes the boys in blue (they can almost do no wrong in his book) and still sort of wishes he was one of them. But, despite his great admiration, he keeps both eyes open and notices the missing Babitch hidden away in the back of the car belonging to officer Ray Donlan (Harvey Keitel). The media goes immediately into "feeding frenzy state" about the fate of Babitch and IA investigator Moe Tilden (Robert De Niro) is called in to head a task force. Suspecting a cover up, Moe tries to get Freddy on his side. Donlan was Tilden's partner once upon a time, but no love has been lost between the two since Moe "defected" to Internal Affairs. It's a film with more "bad cop, bad cop" than "good cop, bad cop". What goes on in this film is frightening because it is so believable. Frank Serpico himself, commenting on the film, said that the events portrayed are easily conceivable. Writer/director James Mangold, commenting on the milieu of change in the 70's among the police community, says that people depended on them, but no longer revered them. "Crime felt out of control. And cops became this barrier between the community and chaos. Thanks to the legal system, cops started to feel really useless, like they could be arresting someone one day and putting them back on the street the next - garbage men. I noticed that all of these factors created a real sense of anger, because cops felt like they were risking their lives every day for no reason. They weren't heroes to anyone - not to the public, not to the city, and certainly not to the people they arrested. It was like a municipal Vietnam. cops came home every day asking, "what did I do? why is this happening? I don't understand." 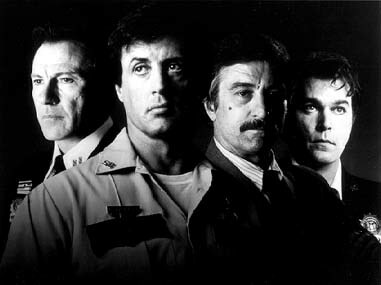 The talents of DeNiro, Keitel, Stallone, Liotta, and Sciorra together on the screen brink upon ensemble acting, with strikingly brilliant, yet subtle performances. But the star billing should really go to writer/director Mangold and producer Cary Woods, two names with considerable credits behind them who are bursting onto new horizons (big time). Mangold debuted as writer/director in 1996 with "Heavy," winning the Grand Jury Prize for Best Direction at the Sundance Festival and Woods has recently created the production company Independent Pictures whose first release was "Kids". (Woods also produced the thriller "Things to Do in Denver When You're Dead." Can ya' hear me, Ed & Ted?) Not a bad combination when you're thinking about making a film. And, as could have been expected by anyone with foresight, they've come up with the goods. In the film, however, it's all up to little Freddy. Is he up to saving the day? After all, it's not who you are, but what you are. Or should that be the other way around? Crazy days. I wonder if Giulianni attended the New York premiere, or if he displayed zero tolerance at the thought of it.